Is there such a thing as a former Longhorn? These players will always be Longhorns to University of Texas fans, even though they’ve graduated to the next level of football. Every week we’ll update you on how they performed the previous weekend. Here’s a look at the Longhorns in the NFL and how they fared in Week 2. 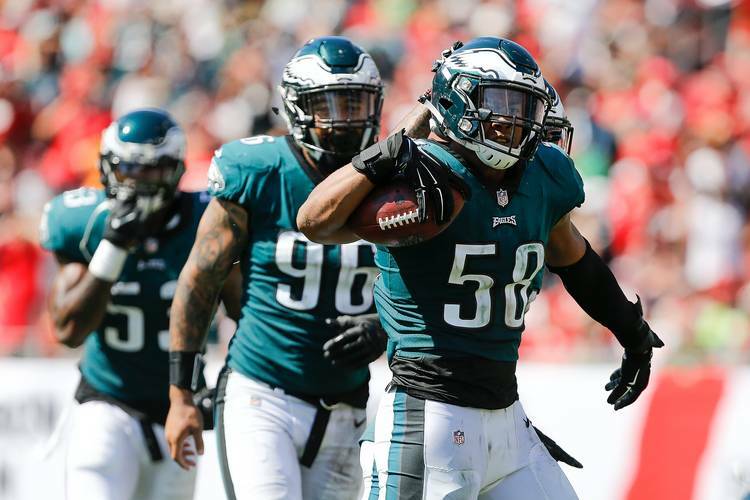 Jordan Hicks has been a big part of the Eagles defense so far this season. He led the team with nine tackles in Sunday’s 27-21 loss to the Buccaneers. Tampa Bay’s on fire right now with a resurgent Ryan Fitzpatrick at the controls. Hicks made six solo tackles and a half tackle for loss and came away with a fumble recovery. Earl Thomas and the Seahawks are 0-2 and it makes you wonder if he will stick around or if the Seahawks will try to get something for their future in a trade. Thomas still has some tread on the tires and showed it Monday night, making six tackles in the 24-17 loss to the Bears. Justin Tucker made all of his kicks on Thursday night, connecting on a 55-yard field goal while making both extra points. As you can see on the replay below, he definitely had room to spare on the long field-goal attempt. Malcolm Brown, backup running back for the Rams, actually led the team in rushing this week. He had 12 carries for 46 yards while the team’s starter Todd Gurley rushed for just 42 yards on 19 carries. Much of Brown’s work was done when the game was out of hand, however. His prowess at picking up the blitz was highlighted during the game. Brown puts linebacker Josh Bynes on his back in the play below. Quandre Diggs had another solid game for the Lions. He made five tackles and broke up two passes, but one of his plays cost the Lions dearly. The 49ers were clinging to a three-point lead with more than two minutes left to play when the Lions made a game-changing interception. The play was called back, however, as Diggs was flagged for holding. Have a look at the play below and see if you think the flag should have been thrown. Michael Dickson, P, Seahawks—7 punts, 45.1 average, 1 inside the 20 and a drop kick. Kenny Vaccaro, S, Titans—6 tackles in the 20-17 win over the Texans. Adrian Phillips, CB, Chargers—5 tackles and an interception in 31-20 win over the Bills. Derrick Johnson, LB, Raiders—5 tackles in 20-19 loss to the Broncos. Malcom Brown, DL, Patriots—5 tackles in 31-20 loss to the Jaguars. Brian Orakpo, LB, Titans—1 tackle and quarterback hit in 20-17 win over the Texans. Alex Okafor, DE, Saints—2 tackles in 21-18 win over Browns. Holton Hill, CB – Vikings—1 tackle and a kickoff return of 28 yards in 29-all tie with the Packers. Geoff Swaim, TE, Cowboys—No receptions in 20-13 win over the Giants. Trey Hopkins, OG, Bengals—Filled in at center to help Bengals gain 108 yards rushing, 265 yards passing and four touchdown passes in the 34-23 win over the Ravens. Connor Williams, G, Cowboys—138 team rushing yards, played every offensive snap. Sam Acho, LB, Bears—26 total snaps played, 15 on defense, 11 on special teams. Phil Dawson, K, Cardinals—No stats as the Cardinals were shut out 34-0 by the Rams. Colt McCoy, QB, Redskins—Backed up Alex Smith in 21-9 loss to the Colts. Malik Jefferson, LB, Bengals—18 snaps played on special teams, according to Football Outsiders, in 34-23 win over the Ravens. Poona Ford, DT, Seahawks—15 total snaps played, all on defense in 24-17 loss to the Bears. Hassan Ridgeway, DT, Colts—14 total snaps played, 12 on defense, 2 on special teams in 21-9 win over the Redskins. Marcus Johnson, WR, Colts—14 total snaps played, 5 offensive, 9 on special teams in 21-9 win over the Redskins. Marquise Goodwin, WR, 49ers—DNP due to an injured quad in 30-27 win over the Lions.